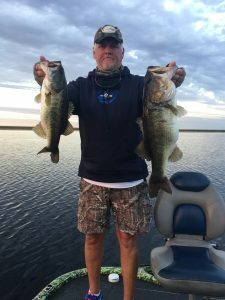 www.okeechobeejust4bass.com (910) 330 9821 Weekly Bass Fishing Report For The Week of Nov 10 – Nov 18, 2016. This week on Lake Okeechobee has been great with the week of the full moon the big fish are moving in. The winds have been light from the North/ East. The water temperature is in the low 70’s and the water clarity is good throughout the lake. The best bait right now is shiners for big fish. You can catch fish on artificial but with the front we had 2 days ago things has slow down on artificial but there is a Senko bite fishing it reel slow. Good areas to fish are the Pass, Kings bar, Tin House, J&S and also the Lakeport area of the lake. You can check the water level on Lake Okeechobee at www.okeechobeejust4bass.com. here is a picture of a couple of fish I caught this week.